Margaret Braun, the author of Cakewalk, is a New York‐based artist who has redefined the art of cake decorating. In the 1980s, Margaret worked her way through various New York bakeries developing a distinctive, boundary‐breaking style that fuses the food arts to the fine arts. 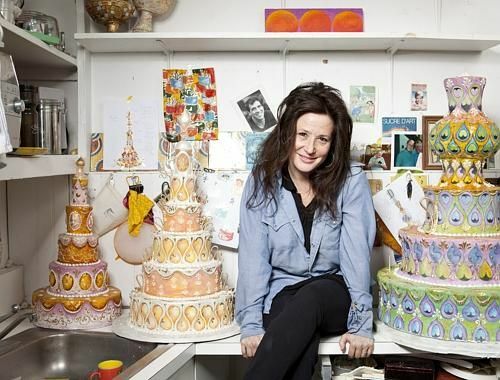 Her various projects have included creating 2,000 wedding cakes for a royal wedding in the Middle East and Marilyn Manson’s wedding cake in a castle in Ireland; making a sugar mosaic sculpture at a Venetian palazzo; decorating a dance company with icing in Berlin; and and fashioning a 30‐foot‐tall DayGlo firework‐blasting cake sculpture. As an artist in residence at the Museum of Arts and Design in New York earlier this year, she completed an installation called 2,000 Sugar Cups. This project was a reflection on her work in the kitchen and was an exercise on how individuality can thrive when set against sameness.